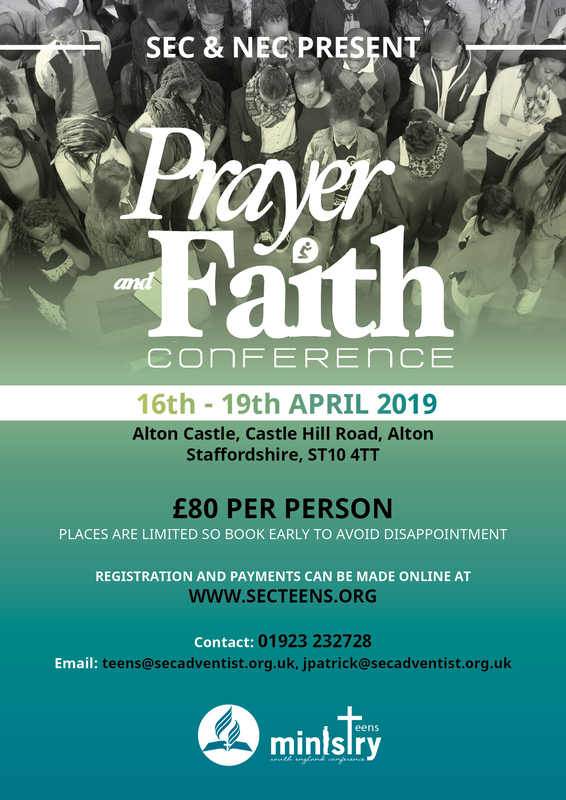 The Teens’ Ministries departments of both the North & South England Conferences of Seventh-day Adventists have the pleasure of inviting you to the Prayer & Faith Conference: a life changing event that will take place from the 16th to the 19th of April 2019. Remember, the Easter holidays vary from institution to institution, so don’t forget to check that the dates fit in with your school/college term break. For years Prayer & Faith Conference has been a faith transforming experience for teenagers from across the country and beyond. This year is your chance to come and experience why! Join with friends from all over the country and experience the power of God’s blessings through prayer, fellowship and socialising. Please fill out the form below to register your interest, and make your payment to confirm your place. Unfortunately because of space limitations we are not able to accept all applications so PAY NOW to avoid disappointment! Places are allocated on a first-come-first-served basis once we receive your completed registration form and payment. 1. Your place is not reserved or guaranteed until we receive: (i) complete registration form, (ii) payment, (iii) signed parental consent. 2. Places are limited and will be allocated on a first-come-first-served basis once we receive all three of the above. 3. No refunds will be issued for cancellations received 14 days (or less) before the event start date. You will receive your payment receipt directly from PayPal, and a booking confirmation from the SEC Teens’ department should follow within five working days. If you haven’t heard from us after one week, please call or email (afrancis@secadventist.org.uk) — there is no need to send your PayPal receipt unless we specifically ask for it. You can also make a debit/credit card payment over the phone by calling the Teens’ Ministries department on 01923 232728.